While the EHF's women's under 19 and under 17 events are about to happen in the coming weeks, next year's younger age category tourmanents are already taking shape. On Tuesday, the preliminary round groups for next year's Men's 18 and Men's 20 EHF Championships were drawn in Vienna. 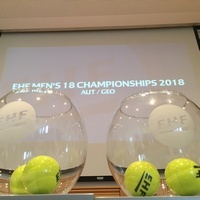 The draw was conducted by the EHF's Chief Sports Officer Markus Glaser and Bernd Rabenseifner, Secretary General of the Austrian Handball Federation. The Men's 18 EHF Championships 2018 take place in Austria and Georgia. Playing dates are 10 to 19 August 2018. The EHF Championship in Austria is played with 12 teams, the Georgia event with 11 teams. The Men's 20 EHF Championships 2018 are played in FYR Macedonia and Montenegro and take place from 20 to 29 July. Both events are played with 11 teams each. The 'Championships' are the EHF's second-tier tournaments in the respective age categories and offer the possibility for promotion to the younger age category EHF EURO events for the participating teams.